After the seventeen day war was over, the battlefield at Kurukshetra littered with the bodies of the millions who had died, Hastinapura under the control of the Pandavas, the survivors no more than what could be counted on one's fingertips, what else was left? When all had been said and done, or so one thought, it turns out that there was still a lot left to be said. If you believe that the Mahabharata at one point consisted only of a small and relatively short core of approximately twenty-thousand verses, then its current size of a hundred thousand shlokas is sure to baffle (though it must be pointed out that the Critical Edition, including Hari Vamsha, is a shade less than eighty thousand shlokas). Among the many questions that may arise, the principal one is likely to be - "where?!" "Where" as in where did the epic become an epic, in a literal manner of speakingiterally speaking? When did "Jaya" become "Bharata" and then "Mahabharata"? The short answer, and I use the word "short" deliberately, is in the Shanti and Anushasan Parvas - the twelfth and thirteenth parvas respectively. The long answer is nineteen and a half thousand verses. If you take the seventy three thousand shlokas that constitute the Critical Edition of the Mahabharata - as compiled over nearly half a century by the scholars at Pune's Bhandarkar Oriental Research Institute, and not counting the approximately six and a half thousand shlokas of Hari Vamsha, which is considered a "kheel" (appendix) to the epic - then twenty six per cent - a full quarter and then some - of the epic is contained in these two parvas. If you have not heard of these two parvas, then the fault is not really yours. Almost all re-tellings, adaptations, abridgments have given these two parvas short shrift. C. Rajagopalachari's timeless retelling does not devote much space to these two parvas. Devdutt Pattanaik's recent bestseller, "Jaya", also devotes no more than half a chapter - out of one hundred chapters in the book. Even John Smith's very novel semi-abridged translation summarizes the Shanti and Anushasan Parvas in a little over a hundred pages - out of the nearly eight hundred pages in the book, and with no translation, just abridged chapter-wise summaries! Why these two parvas got the short end of the stick in abridgments and re-tellings is not difficult to decipher. Pretty much the story is all but over by the time the Shanti Parva begins. Bhishma lays dying on the battlefield, waiting for Uttarayana to commence so he can leave his mortal body. What little is left to be told will be told with brutal brevity in the Ashramavasika, Mousala, Mahaprasthanika, and Svargarohana Parvas. The destruction of Dwarka will take place only in Mousala Parva, and it is dealt with in less than three hundred shlokas of densely-packed action. Even the Pandavas' journey heavewards and Yudhishthira's reconciliation to heaven takes up less than two hundred shlokas of Svargarohana Parva. Most of what is recounted in the Shanti and Anushasan Parvas is then really Bhishma's advice to Yudhishthira on statecraft, on dharma, donations, interspersed with countless stories. It is in these stories that the reader is likely to find the maximum interest as well as frustration. Yes, the plot is not really moving anywhere, and there is hair-tearing meandering at times, along with several passages that seem very out-of-place, what Dr. Debroy calls "later insertions", and what John Smith called "densely didactic" (in the introduction to his abridged translation). But that is not the point. If you do not care for these parvas, then any number of abridged retellings will do. To truly understand the Mahabharata it is, in my opinion, vital to read it in its entirety. Ideally in its Sanskrit form. If not, then in whatever language you are most comfortable with. Volume 8 had the Raja-dharma, Apad-dharma, and a little less than a thousand shlokas from Moksha-dharma parvas within Shanti Parva. Volume 9 contains the rest of the approximately six thousand shlokas of Moksha-dharma Parva, as well as two-and-a-half thousand shlokas from Dana-dharma Parva of Anusasan Parva - all about attaining salvation. In Volume 9 we get to read how Shiva's bow came to be known as Pinaka, how Shukra got his name - he who used to be known as Kavya Ushanas, how Vritra was killed by Indra using the power of yoga, or several stories concerning creation, including one where Brahma, after being asked by Narayana to create "different categories of subjects", worries where he would get the strength to do so, thereby laying the need for Narayana to express himself on earth in various avatars. Or that the demons Madhu and Kaitabh were created on Narayana's instructions himself, invested with tamas-ic and rajas-ic qualities. These two demons are mentioned countless times in the epic, mostly when referring to Krishna or Vishnu. It is in Moksha Dharma Parva that we actually get to read in some detail about Madhu and Kaitabh. Then there is the oft-heard story of how the moon came to wax and wane, and there are several variations there - this time on account of Daksha's curse. Perhaps the most fantastical tale is that of the people of Shvetadvipa - massive beings with more than sixty teeth and who have been cleansed of all sin. Or the story of Shuka, Vyasa's son, born from the rubbing together of kindling sticks - it makes for an interesting read for sure! The thousand names of Vishnu figure in the Anushasan Parva - but they are to be found only in the tenth volume. However, this ninth volume does reward the reader with the thousand names of Siva, in the seventeenth chapter of Dana-dharma Parva (within Anushasan parva). As is the tradition in the Mahabharata, not only is the content important - in this case the thousand names of Siva - but also equally important is to establish how this knowledge came to be in the possession of the narrator. In this case, starting with Brahma, this knowledge passed through more than ten people before being recited to Yudhishthira. Even the thousand names represent the "essence" of the more than ten-thousand names of Siva that Brahma had first revealed! Among the innumerable stories contained within this volume, perhaps the most fascinating is told as a response to a question from Yudhishthira to Bhishma. The story of Bhangashvana and Shakra (Indra) is well-worth reading, and I will leave it at that! In any translation, a critical measure of its success is in its fidelity to the original. In this case, since the original is in Sanskrit, Sanskrit scholars can best opine on that. Since I do not know the (Sanskrit) language, I have nothing to add on that topic. In some ways, what a translation does achieve is normalization - the better and inferior passages are all normalized during the course of the translation, with the result that the reader can focus more on the plot than the style. This has its merits as well as demerits. For example, there is little of the beauty of the passages in the Gita that come across as a result. On the other hand, some of the frustrations faced by the translator, Dr. Debroy in this case, are only hinted at - as in Chapter 303, where the title of the chapter itself is footnoted as being "extremely difficult to understand" and therefore which necessitated "liberties"! 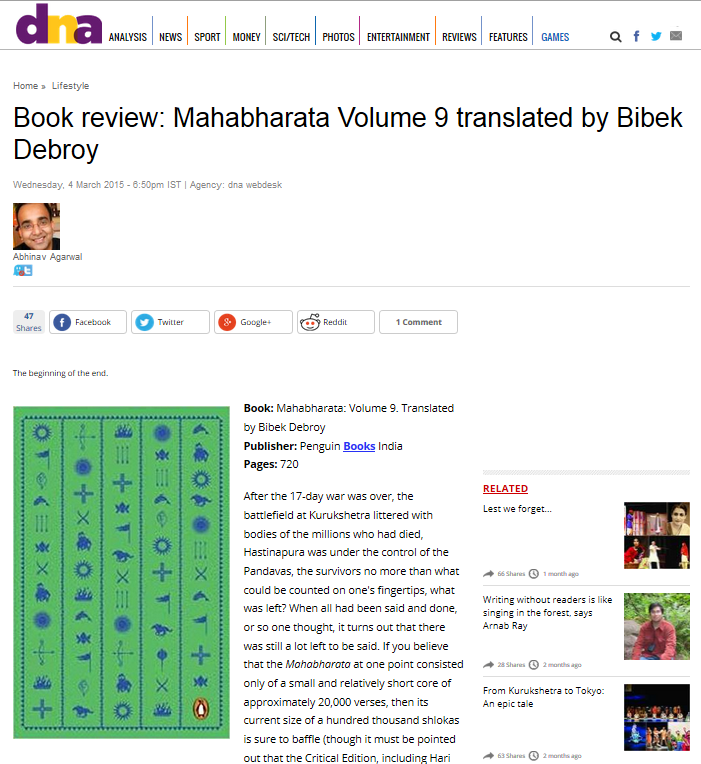 This then is Volume 9 of Dr. Bibek Debroy's unabdridged translation of the Mahabharata, based on the Critical Edition from Pune's Bhandarkar Oriental Research Institute. The tenth and concluding volume in this humongous translation was released concurrently with ninth volume, so the latest unabridged English translation of the Mahabharata is now complete. This review first appeared in DNA on March 4, 2015.